Who is the Athletic Report for? Whether you’re a high-performance athlete or just trying to gain an edge on your rec league competition, the Athletic Report will provide you with information to help make you a better athlete. No matter your goal, understanding your DNA can optimize the journey. Depending on your genes, there are many insights to help improve your performance including the optimization of post-workout recovery, nutritional supplementation, and the type of training intensity that may work best for you. Depending on your genetic variants, you may need to spend more time training a specific area of strength than others. We have found the best options for you to improve your training, recovery, and nutrition. Your aerobic system powers your endurance performance. Certain factors, such as mitochondrial growth, vascular function, and fat oxidation influence your body's aerobic efficiency. Learn how your DNA influences your endurance abilities and how to utilize your strengths to make the most impact. Understanding whether you are a power or endurance orientated athlete can allow you to bias your training program to reflect your unique athletic abilities and needs. Your ability to produce maximal force is influenced by many factors, including your DNA. Learn how your genetic factors can influence your muscle strength and muscle growth. Your speed and power ceiling is limited by your genetics, muscle morphology and anthropometrics. Understanding how your genetics impacts your speed and power ceiling will enable you to set expectations around your program and assist you in prioritizing your training efforts. 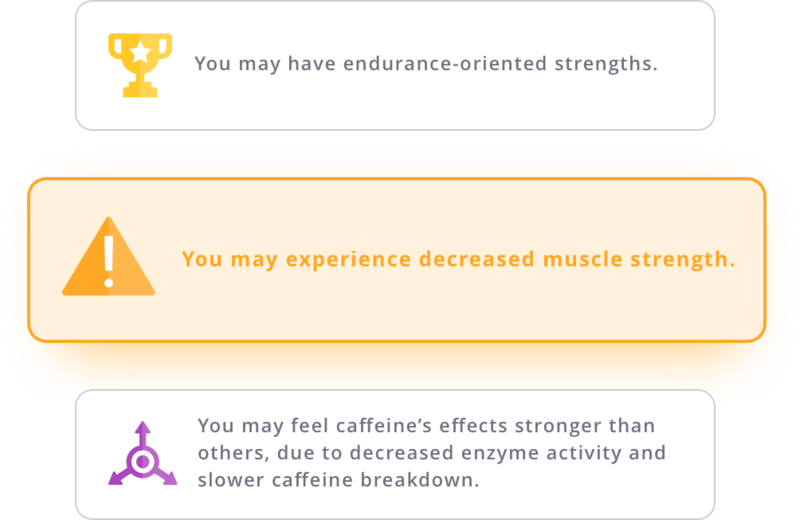 Many other factors like body temperature and caffeine sensitivity can impact your overall performance. Learn how your DNA impacts these traits. There are multiple factors that influence injury risk, including training and physical techniques, and your genetics. Knowing how your genetic variants influence your injury risks can help you tailor your training to lower these risks with proper form and strength training. The recovery period is when your body adapts the most – but the amount of recovery you'll need depends on your goals, your unique physiology and your DNA. Understanding how much recovery time you require is crucial to keeping your tissues and muscles happy, as well as performing to the best of your abilities. Getting enough sleep is critical for reaching your maximum performance potential. Find out if your genes are influencing your sleep quality and requirement. Your endocrine system helps to regulate all the organs in your body by producing signaling compounds called hormones. Your endocrine system is very sensitive to changes in your environment, and with the help of your genetics, you can learn how your DNA influences your blood levels of these hormones. Your mental capabilities can play a big role in sports performance. Your DNA can influence how your mental performance compares with your athletic performance. Understanding your tendencies can help you to initiate discussions with your coach or your peers and start to understand athlete diversity. The Athletic Report is approximately 60 pages (it differs based on your DNA) and analyzes over 100 markers to provide insight into 40 traits. Your body is your greatest asset. In order to keep it strong and healthy, you need to take care of it. 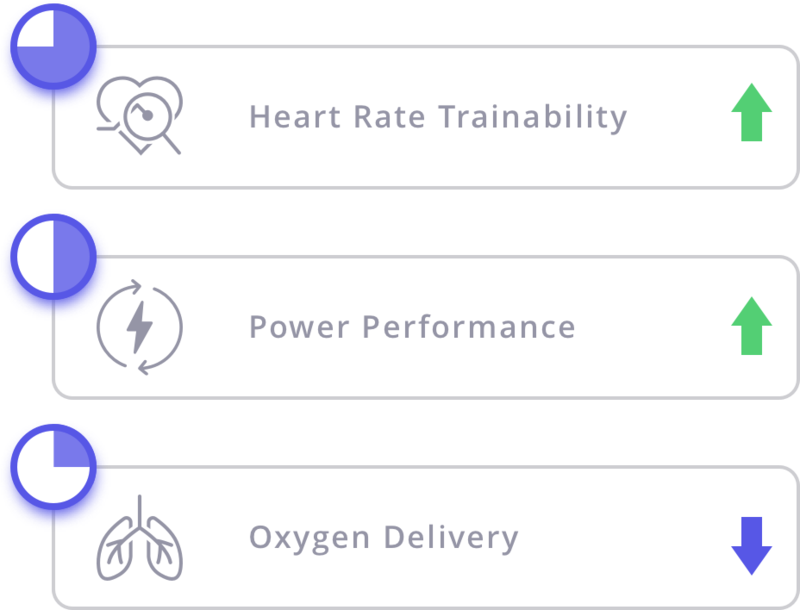 Athletigen’s apps give you the insights you need to understand your body, leading to optimal decision making. Athletigen maintains the highest standards of data privacy and will never sell or share your personal information or data. See Athletigen's privacy statement and ethics statement for more details.